The Certified Administrative Assistants (CAA) certification exam prepares individuals for a career as an Administrative Assistant/Secretary across a wide range of professional companies. Attaining national certification displays that individuals have studied and mastered the necessary skills to be a recognized professional in the field of Administrative Assistants. Certified Administrative Assistants (CAA) performs organizational, administrative, and clerical duties in a multitude of settings. The Certified Cannabis Budtender (CCBT) certification exam prepares individuals for a career as a budtender or dispensary worker in the cannabis industry. The Certified Cannabis Budtender (CCBT) certification exam prepares individuals for a career as a Cannabis Professional. Attaining national certification communicates to clients that individuals are committed to providing the highest level of standards in the Cannabis profession. The Certified Cannabis Dispensary Management (CCDM) certification exam prepares individuals for a career in the management of a cannabis dispensary. Managing a marijuana dispensary is similar to managing any other retail store: manage the staff, track inventory, and cultivate a clean, professional atmosphere, but the highly regulated nature of the product makes it a bit more complicated. The Certified Cannabis Edibles Professional (CCEP) certification exam prepares individuals for a career in the growing cannabis cooking and edible industry. Certified Cannabis Edibles Professionals (CCEP) infuse food and drinks with cannabidiol (CBD) tetrahydrocannabinol (THC). The Certified Cannabis Horticulture Specialist (CCHS) certification exam prepares individuals for a career in the cannabis horticulture industry. The Certified Cannabis Horticulture Specialist (CCHS) certification exam prepares individuals for a career as a Cannabis Professional. Attaining national certification communicates to clients that individuals are committed to providing the highest level of standards in the Cannabis profession. The Certified Catering Associate (CCA) certification exam prepares individuals for a career as a Catering Professional. Attaining national certification communicates to clients that individuals are committed to providing the highest level of standards in the Catering profession. The Certified Child Care Worker (CCCW) exam prepares individuals for a career as a Child Care Worker. The certification displays mastery of the latest information and skill practice necessary to be a successful Certified Child Care Worker (CCCW) in a variety of settings. The Certified Dental Office Assistant (CDOA) exam prepares individuals for a career as a Dentist Office Assistant. The certification displays mastery of the latest information and skill practice necessary to be a successful Certified Dental Office Assistant (CDOA). The Event Planning Specialist Certification (CEPS) exam from the National Career Certification Board (NCCB) prepares individuals for a rewarding career as an Event Planning Professional. 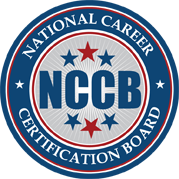 One of the best ways to distinguish yourself in the Event Planning industry is to pursue a national certification from NCCB. The Certified Health & Fitness Coach (CHFC) certification exam prepares individuals for a career as a Health & Fitness Coach. Attaining national certification displays that individuals have mastered the skill set necessary to become a successful and highly recognized professional in the field of Health & Fitness Coaching. Certified Health & Fitness Coaches (CHFC) are part of one of the fastest growing employment industries today. The Certified Mental Health Technician (CMHT) exam prepares individuals for a career as a Mental Health Technician. The certification displays mastery of the latest information and skill practice necessary to be a successful Certified Mental Health Technician (CMHT). The Certified Nutritional Coach (CNC) national exam prepares individuals for a career as a Nutritional Coach. Attaining national certification displays that individuals have mastered the latest industry information and skill set necessary to become a successful and highly recognized professional in the field of Nutritional Coaching. The Certified Renewable Energy Specialist (CRES) national exam solidifies individuals as nationally recognized professional who specialize in Renewable Energy (CRES). Designation as a Certified Renewable Energy Specialist (CRES) will allow you to stand out as a Renewable Energy Specialist. The Certified Stress Management Coach (CSMC) national exam prepares individuals for a career as a Stress Management Coach. Attaining national certification displays that individuals have mastered the latest industry information and skill set necessary to become a successful and highly recognized professional in the field of Stress Management Coaching. The Certified Sustainability Specialist Certification (CSS) national exam distinguishes individuals as leaders in sustainable development. National Career Certification Board’s (NCCB) Certified Sustainability Specialist (CSS) designation is designed for individuals who want to stand out and earn professional credentials to lead businesses in the best sustainable practices. The Certified Veterinary Office Assistant (CVOA) exam prepares individuals for a career as a Veterinary Office Assistant. The certification displays mastery of the latest information and skill practice necessary to be a successful Veterinary Office Assistant Certification (CVOA) in a variety of animal medical practice settings. The Certified Wedding Planning Professional Certification (CWPP) exam prepares individuals for an exciting career as a Wedding Planning Professional. The certification displays mastery of the latest information and gives you the credentials necessary to launch and run your own successful Wedding Planning business or find employment in an established business. The Certified Wellness Coach (CWC) national exam prepares individuals for a career as a Wellness Coach. Attaining national certification displays that individuals have mastered the ability to be recognized as the powerful tool for change that has Certified Wellness Coaches (CWC) being sought out by clients for a variety of motives.